In order to know what we most value, we need to experience not only having it, but not having it. I think premortality likely taught us what it was like to live with an eternal, godly family loving and working together. We had the example of perfect parents caring for us. That wasn't enough motivation for many of God's children to stick to his Plan, those of us here did....but maybe not yet capable of doing so with the level of commitment we need to fully give ourselves to others without fear to his Will so that we can be one with God and each other. This world....I think we are learning what it is like to live without our families being united as one and without the perfect expression of God's love in each and every moment (because we are incapable of fully experiencing it, not because it is being withheld). We are experiencing what being isolated from each other is like. We can't even be sure the rest of humanity isn't a figment of our imagination, that this life isn't a dream, but Reality. Will we learn that we are satisfied with less than, will it be enough for us or will we learn from the pain we have now that we are willing to do whatever it takes? Are we a person who expects someone else to remove our pain or do we get motivated to work towards change, to prepare ourselves to make the change where we can and to open ourselves up to God when we need him? To better listen, to be willing to learn from others, to embrace the pain of humbling ourselves, the pain of letting go our selfish protections and make ourselves vulnerable by opening ourselves up to others, especially God? Your quote prompted me to recall other related church material, in particular an article distinguishing between paralyzing discouragement and divine continent (see HERE), as well as Michelle Craig's October 2018 Conference talk on the subject, particularly the quote from Sister Kimball, "Never suppress a generous thought." I’m a pretty positive person, my life is pretty good generally. But I’m starting to see a few things clearly and it’s disappointing to me. One thing I recognize clearly is my shortcomings as a spiritual leader in the home. My husband is not a leader. I didn’t want the role so I didn’t do enough. I have three very active children and two who are not so active. Good people, all of them . I did not fulfill my calling as mother. We did all the activities, but missed the spirit. I know my original error but could not have seen it when I was 23 and setting my course. But you were on a course at 23, or turned one since, that gives you the vision you have today. Regret is sometimes a consequence of seeing how far we've come, which we could not do without the Lord having confidence in us. Your children are good people, and not only does that speak volumes, it will provide the happiness which will check-mate the regret. I hope you are visited with much comfort tomorrow! I saw a sign at the garage today where I was getting some work done (on my car...)... "Today may not have been a good one, but there is some good in every day." Amen! My hope and prayer is that as members of the CofJCofLDS….we all can simply become converted to what our Leaders have been preaching to us....and that is for us to simplify our lives, just wake up each morning and turn toward the light, extend forgiveness and ask for forgiveness....and love one another as the Savior loves us. I hope we can stop with heaping guilt upon ourselves for not being the perfect member, stop comparing our efforts or successes with anyone else. Pres. 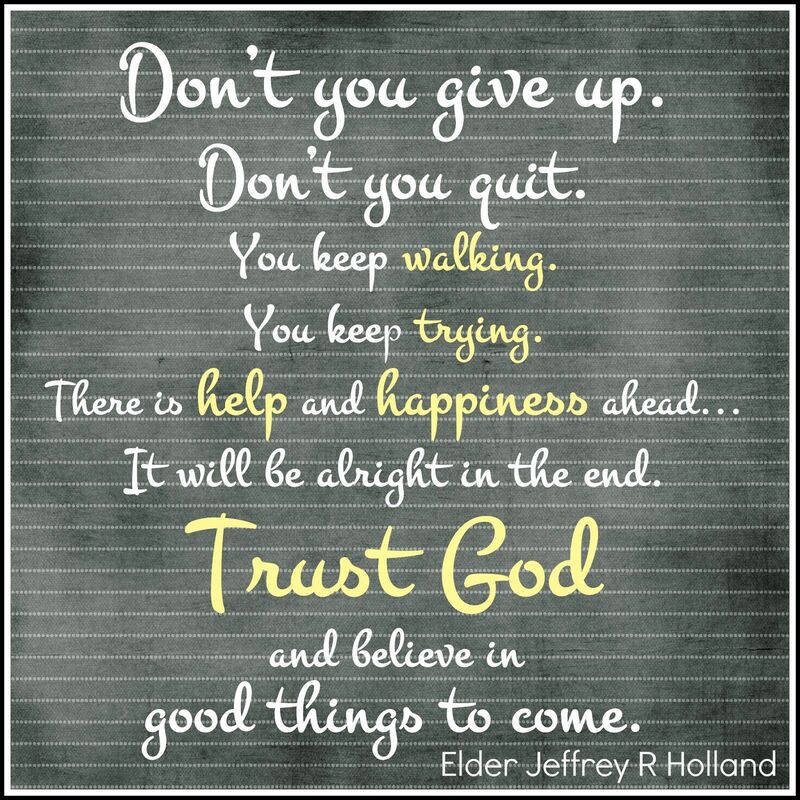 Hinckley taught us to just "be a little better each day". In 1977 when my Wife and I (19yrs old) ...at 1045pm on a Tuesday night...in front of the Mission home in Indep. Mo...had our own personal moment with Pres. Kimball.....just the three of us....standing on the sidewalk...in the lamplight, he went straight to my wife...cupped her face with his hands....and gently kissed her on the cheek, then he turned to me and lovingly pointed his finger at me and said "you always cherish her! ".....and I said..."I will President". He didn't ask about my marriage, my family, my church activity...etc. The most important thing the Prophet of the Lord wanted me to do, the one thing that he wanted to have the spirit witness deep into my heart and soul at that moment in time....was to always love and cherish my wife. It will be 47yrs this coming August 4th. The Holy Ghost bore witness to me in that sacred moment....that there was a Prophet on the earth. I knew it, and I knew that God knew it...and I could not deny it. I needed, and had asked God for my witness and for the strength to face what was headed my way. I remember that moment like it was a second ago. It wasn't about celebrity....it wasn't about be caught up in the moment...or just being normally overwhelmed with the sacred moment the Lord had given my wife and I. It was none of that. It was a solid and unmistakable witness from the Holy Ghost that even a 19yr old Father of three could not mistake or deny. All of these many decades later...that gift I was given then.....is still with me to this very moment. My father committed suicide a few months later, my mother died 5yrs later, my brother was killed in an accident at home..more kids came....and through it all....I remember that moment when the Prophet of the Lord lovingly looked at me...just me...and gave me my lifes commission "you always cherish her!" 120 seconds...my life was forever changed. 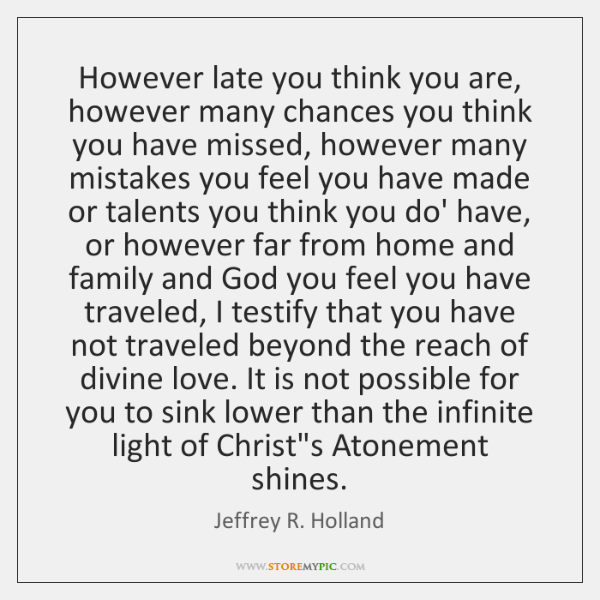 So....yes, we're not perfect people...but we have a loving HF and Savior that knows each of us personally...and knows our heart and our desires and our needs. I'm convinced now more than ever that all we need to do is our best or even our not so best (on any given day) and that is sufficient. The Lord...through his infinite Atonement and grace will make up the difference. Lets stop trying to mark every box....and rather.... start to just love one another more fully each day and give thanks for all our blessings! My strongest witness was in a moment of desperation when my daughter was actively resisting most efforts to help her, including some simple painless solutions because she couldn't bear to deal with the implications of what diabetes meant to her for the next 85 years. It was a moment of intense peace telling me to let go of the fear, that she had to find her own path and at the end she would be where she needed to be. If I hadn't had that moment, life would be one long panic attack, I expect. I am a natural helicopter parent (hopefully not in the sense of telling my kids they have to do things a certain way, but more protective). I just don't "let go". I am frequently shocked at the results of that wonderful gift. Much encouragement here today. I appreciate that, in the face of my vulnerability. Yesterday I was thinking, the church is such a joyous place for the hopeful, and such a terrifying place for the hopeless. Wouldn’t it be great to just believe we are all saved in our belief, have donuts and socialize and go home and rest easy. The truth we are taught requires much. I’ll try again tomorrow. Thank you again. I’m humbled. You have received many good answers. If I understand your issue, try to remember that results do not equal quality of effort. My wife tends to measure her self-worth by the results she sees. It pains me to watch her do it because I know the true effort she puts into everything she does. Please don't live your life like this. She dedicatedly raised each of our 3 children, but the first just didn't really seem to have the same spirit as the last two. Nevertheless, the Lord finally spoke to his heart, and he decided to go on a mission. Being a parent is a trying task, and you simply cannot measure "your results" of what you perceive others having. Watching other parents do that is also hard. One family in our neighborhood are the sweetest people, but one of their sons got into drugs. You prepare your children the best you can for the world, and that is what the Lord looks upon. Hopefully it is also a place where the hopeless find hope. I know that's how it works for me! The truth we are taught requires much. I’ll try again tomorrow. Which is the whole plan. I rejoice in a merciful and wise Father who sent me out of his presence where I can make mistakes and then provided a Saviour so that I can forever hold fast to what I learn from those mistakes and yet be freed from the awful burden and any eternal consequence of having made them. I feel like my whole life consists of learning things I wish I'd known 20 years ago ... and repeating mistakes that haven't quite bitten hard enough yet. AMEN!! This reminds me of a poem I learned a while back...it goes like this "Plod on Plod on....Plod on, Plod on Plod on....plod on"
I did not fulfill my calling as mother. We did all the activities,﻿ but missed the spirit. I know my original error but could not have seen it when I was 23 and setting my course. The deep-time message of Jesus’ death is presented through a confluence of three healing images from his own Hebrew Scriptures: the scapegoat whom we talked about on Sunday; the Passover lamb which is the innocent victim (Exodus 12); the “Lifted-Up One” or the homeopathic curing of the victim (Numbers 21:6-9) who becomes the problem to reveal the problem. It is precisely the beloved and innocent “lamb” that must die. We must accept that we are all complicit and profiting from the corporate “sin of the world” and no one is pure or innocent. “No one is good, not even one,” as Paul daringly quotes Psalm 14:3 (Romans 3:10-12). This is an offense to our ego, and is precisely the status that Jesus accepts and allows. This is a huge but necessary recognition and surrender for most people. The “Lifted-Up One” is the image of the bronze serpent that Moses lifted in the desert which has become a symbol for doctors and healers to this day. YHWH tells Moses to raise up a snake on a standard, and “anyone who has been bitten by a serpent and looks upon it will be healed” (Numbers 21:8). The very thing that was killing them is the thing that will heal them! This is the nature of vaccines and other medicines that give us just enough of the disease so we can develop a resistance and be healed from it. The cross was meant to be an inoculation against all sacralized violence and hatred. The cross dramatically reveals the problem of ignorant killing to inoculate us against doing the same thing. Jesus becomes the seeming problem and the cure for the same—by exposing it for what it is, “parading it in public” (Colossians 2:15) for those who have eyes to see, and inviting us to gaze upon it with sympathetic understanding. The prophet Zechariah calls Israel to “Look upon the pierced one and to mourn over him as for an only son,” and “weep for him as for a firstborn child,” and then “from that mourning” (five times repeated) will flow “a spirit of kindness and prayer” (12:10) and “a fountain of water” (13:1; 14:8). I believe we are invited to gaze upon the image of the crucified and to realize that God the Father suffers with Jesus. This softens our hearts toward God and all of reality. We see that God’s heart has always been softened toward us, even and most especially in our suffering. This softens us toward ourselves and all others who suffer. If you want to go deeper with today’s meditation, take note of what word or phrase stands out to you. Come back to that word or phrase throughout the day, being present to its impact and invitation. Adapted from Richard Rohr, Things Hidden: Scripture as Spirituality (Franciscan Media: 2008), 189-192. This is wonderful of course...but where is that Holy Spirit when you need comfort just a spiritual hug to keep from quiting? This is where people play an important part..yes, even an atheist..when we give support, empathy..and love to eachother...as parents, teachers an communities. Other than that...you wait...and wait...and wait...trust God. There has to be acknowledgement of success an encouragement. (First, everyone is failing as a parent, if perfection is the standard - in fact, everyone is failing simply if ¨your best¨ is the standard. So perfection is not the standard, and ¨doing your best¨ is at best a very compromised term, just like we are compromised as humans. And yet God gives us children - if we´re so blessed. Third, my wife has recently been reevaluating a lot of the beliefs she´s had all her life. Beliefs about how simple and ordained life is. Life is messy. It´s painful. Obviously, I don´t know you, but I suspect you (like all the rest of us) need to let go of some unhealthy, unrealistic beliefs about what life and parenting is and how they actually work. - You could not control your kids and determine what they would be right now (agency). - You did not know all the answers when you had them, nor while you raised them. - Humans (including your kids) are messed up (whatever your theology may be), they are always going to have faults and make mistakes and intentionally do things that are wrong (sin) (ok, maybe that´s not your theology, but it´s the truth). - Parenting is messy and risky - no one is ready for it, no one masters it. And this may hurt a bit - it hurts to write - but we all have and will hurt, stunt, mislead, and damage our children in numerous ways. - Non-LDS Christians chalk this up to the Fall. I don´t know what LDS Christians chalk it up to. But the point is, it is how the world is. It´s better to accept that and start planning, practicing, preparing, and acting proactively from that knowledge than to avoid it or continue to nurture an illusion instead. And it will be easier on you - the sooner you stop blaming yourself from an unrealistic standard, the sooner you let go of the oversimplifications you´ve worked from up to this point, the sooner you can start living and parenting with less guilt and more effectiveness. Fourth, don´t let the past and present be the end of the story. Don´t become so guilty about the past that you can´t face it long enough to learn from it and use those lessons to change the future. Your children´s lives are not over, your life as a parent is not done, nothing is complete. And I think we both believe that God (that Actually Exists) is all about redemption, about bringing about good (which means from not-good and probably bad) for those that love Him. Lastly, this does not mean that you go straight back to believing that your children will still end up just as you wanted them to. Don´t change your view of parenting and your practice of it just to keep the same old vision of what ¨success¨ looks like. That won´t work. Embrace the mess. Embrace the uncertainty. And, in so doing, allow yourself to have faith in (Actual) God. Are there things you did as a parent that were wrong? Yes. Ask God to forgive you and then forgive yourself. Are there things you neglected as a parent? Yes. Ask God to forgive you and then forgive yourself. Then embrace the messy and challenging adventure of life and parenting (even of adult children) with humility and forgiveness and grace and, thus, with realistic hope and real faith. That appears to assume "our best" is a consistent standard that matches how well we can perform without obstruction and that we can even know what is our best. I might be misunderstanding you and you are more or less heading in the same direction as I am with this. We really don't know if we can do something until we do it, after all. If you would choose to act a certain way on other days, but this day, this moment your weaknesses are dominating you for whatever reason (maybe something triggered a flashback to trauma and you are back in it, unable to leave the house or even express what is going on though an hour before and an hour later you do not have that issue), then what is " your best" could truly your best and not a half baked effort that it might have been if done another way. But how can we tell we are not just giving up halfway and instead have actually reached our limits for that particular time. We don't actually have, imo, enough personal insight to know when we have actual agency to choose among at least two options and make the lesser choice due to chosen selfishness. I am not sure therefore how useful it is to talk about doing one 's best. It is so vague and uninformative of a phrase and labels something that is constantly changing. I think it would be better to examine ourselves in more specific ways...do I protect my children, do I provide for needs like _____, do I love my children, how have I expressed that love and did they feel that and if not, why not (me, them, something else), can I find more ways to express that love, do my children understand this ______ that I want to help teach them and if not, can I find other ways that may be more effective? We think in terms of broad goals and I think we set ourselves up to fail unless we also accept broad fulfillment that ends up pretty meaningless. Same direction - thanks for unpacking it for me. My post was was already lengthy. Question: Something in the writing or in my reading is giving me trouble understanding what you mean by the last sentence. Your clarification is appreciated! If we choose to think in broad goals, we set ourselves up for failure. This is because they are too vague (I will be happy) or too massive (world peace) and we can't really know what is enough to fulfill it. We will almost always feel unfinished...which means no sense of goal reaching, which translates to failure. Now if we have vague goals, we could match it with broad descriptions of success...but since too vague to be anything but feel good measures, they are meaningless. For example, my goal is to do something good every day. Well, I got out of bed, that is something good, so I met my goal. My goal is to love everyone, I want the best for mankind, yay! I love everyone. I can meet all my goals without doing much of anything like this. There is nothing life changing in this type of fuzzy wuzzy feel good goal making. For what it’s worth, when Sister Gui and I faced this awful feeling of failure as we lost two sons to addiction and it’s consequences, we found help and peace in the LDS Addiction Recovery Program Family Support group. So much so that we are now going on our 11th year as group leaders. We cannot recommend it too highly....even if addiction is not causing the problems. It is the best Church class we have ever attended. It is where the Atonement rubber meets the real road of life. I´ve thought this might be the case - Addiction Recovery groups being more honest, real, and meaningful versions of whatever religion sponsors them. For one, the people involved are under no illusion of goodness or worthiness, humility has a chance to be undeniable, which means compassion and grace between members can really shine. Also, desperation tends to lead to or at least help surrender, daily surrender, which allows for the acceptance of true mercy and grace from God. What you can get is a group of people who intimately know each other, know they need God desperately, and know they need each other - something like what the Body of Christ is supposed to be. What surprised us, and what was the hardest to accept, was that we cannot fix our loved one.....we can only fix ourselves. Therefore, our struggle is to apply the Atonement to ourselves and let our loved ones work out their own salvation. The groups for those in addiction and for the loved ones of those in addiction are where the hard work happens. We never got this up close and personal with the Atonement in the regular Church classes...perhaps because we weren't desperate enough? This does not mean we abandon them or cease in faith and prayer. Just the opposite. We become the kind of people that will run to meet them if and when they come to themselves and return. Whether it's addiction, pride, sin, apostasy, the principles are the same. What surprised us, and what was the hardest to accept, was that we cannot fix our loved one.....we can only fix ourselves. Therefore, our struggle is to apply the Atonement to ourselves and let our loved ones work out their own salvation. 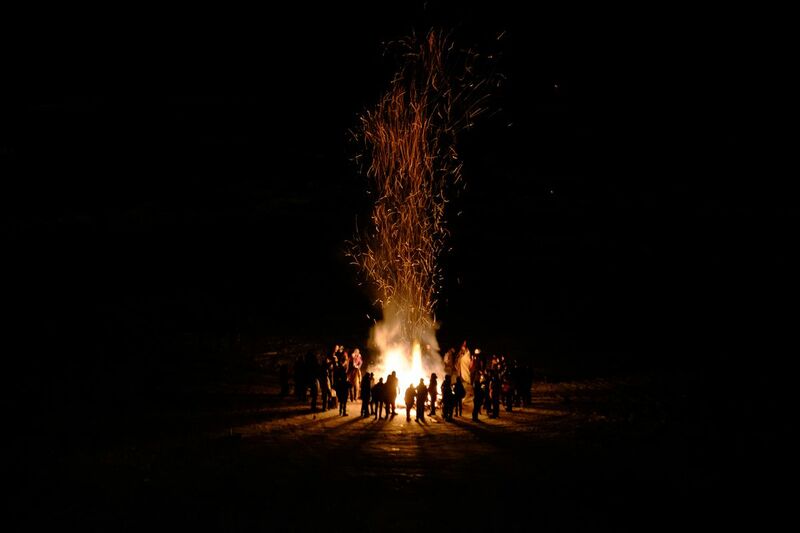 I really like the image of a campfire of faith taken from Elder Gongs Conference talk. There is no guarantee, but if we continue to make our lives a warm and inviting campfire of faith, we increase the chances that our loved ones who are lost out in the cold darkness may see and be drawn again to sit with us around that fire. If we build it, maybe they will come. And, the bigger the fire, the better. For some people beset with things like drugs and mental illness, this may not happen during mortality, but the Easter season gives hope beyond the grave.